BONUS: Ten new pages about Selma Lagerlöf and Sweden added. Three landscape photos included. Selma Lagerlöf is best known in America and worldwide for her masterpiece children’s’ stories. This book presents two famous tales of a young boy who, while flying on the back of a wild goose, learns important lessons about protecting the Earth and its creatures. NILS: The Wonderful Adventures of Nils and The Further Adventures of Nils Holgersson. 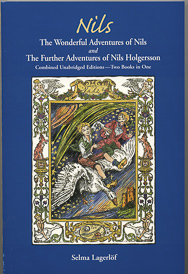 Originally commissioned by the Swedish National Teachers’ Society to teach introductory geography to young Swedish schoolchildren, these adventures, first published in 1906–1907, take flight when Nils, a Swedish imp, is magically reduced to elfin size, gets astride a gander who joins a flock of wild geese that fly a route covering the significant geographical and historical sites of all of Sweden. Along the way, they encounter the consequential elements of survival, both socially and environmentally: predator and victim, friend and foe, the land and its users. Told in a series of narratives, these adventures demonstrate this Nobel-prize-winning author’s skill at defining the sublime in simple, everyday existence. The unabridged, classic stories are by Selma Lagerlöf, a Nobel Prize winner.